Where to start with this quilt? First of all, with my love for Elizabeth Hartman and her designs. 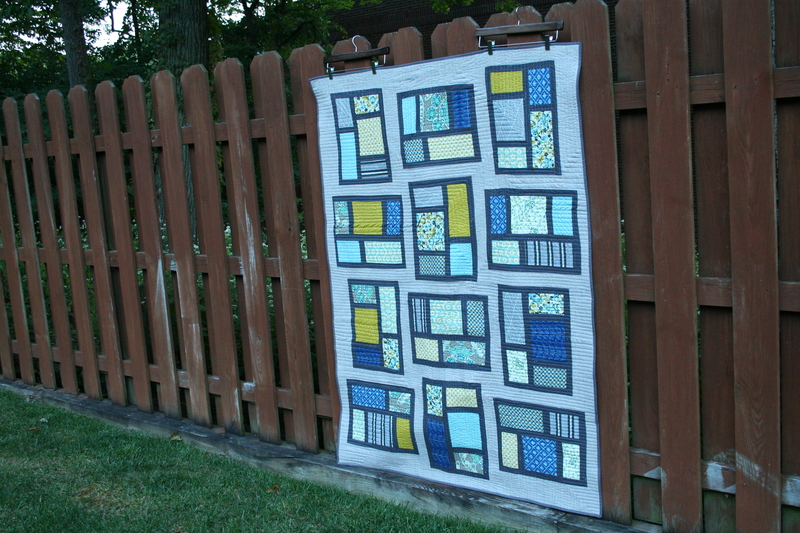 This quilt was made with her “Kitchen Window” pattern from her book The Practical Guide to Patchwork. 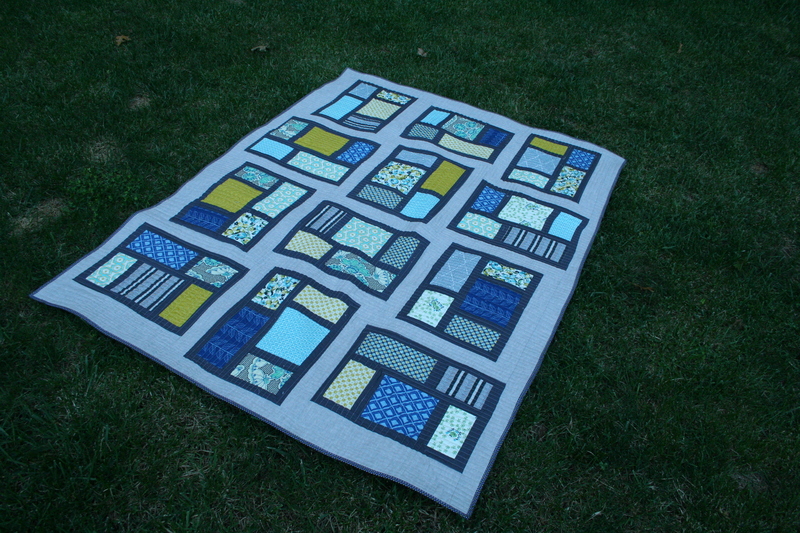 Secondly, with my gratitude for the help I had piecing this quilt. 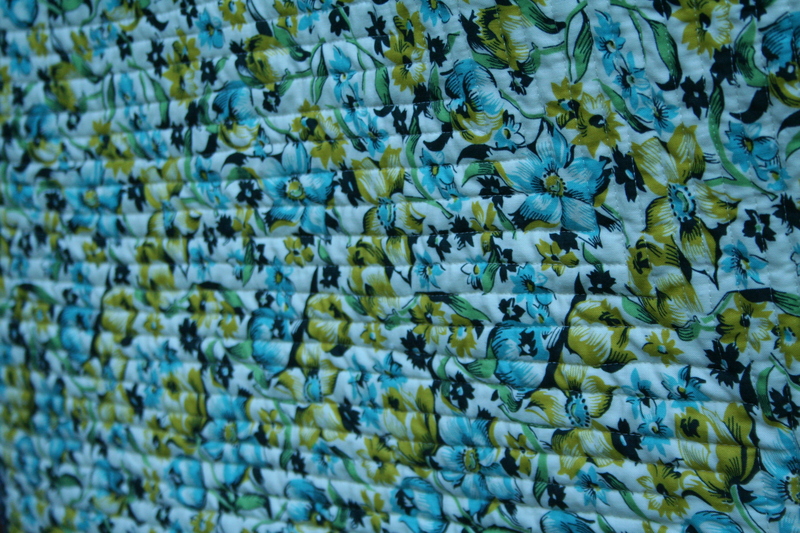 It’s my first bee quilt, made with the help of the Block Party gang from the Newbees group at Rock Paper Scissors. 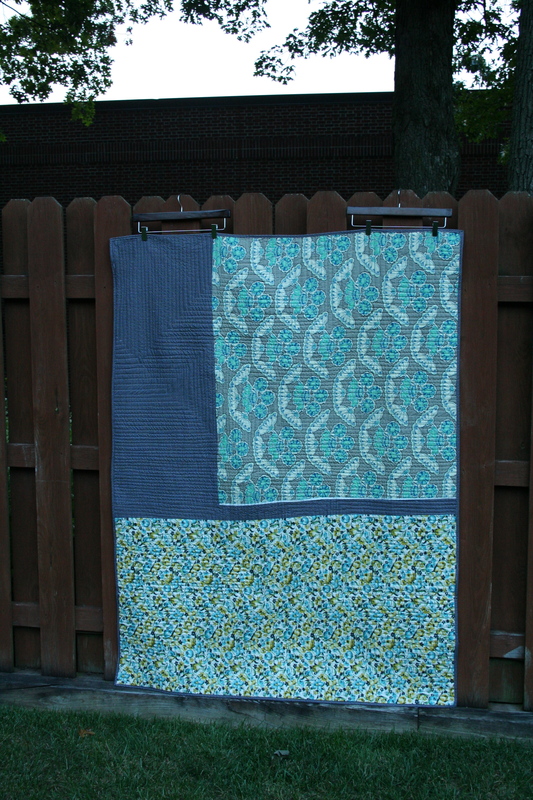 The Block Party members all contribute a block to one quilt a month, and since I am not crazy about piecing, this was a huge help. I’m not sure I would have finished it on my own! It’s one that finally gets to live on our couch. One that I get to use! It goes perfectly in our living room, which is very neutral with a blue couch. The more mellow tones match and the brights pop just right. There’s some Denyse Schmidt, some Anna Maria Horner, some stripes, solid “window panes” and lots of linen. I used all shades of blue and teal with yellow and navy scattered in. But this one gave me so many challenges. The stretch of the linen, the differences in piecing style, my own haste in cutting coming back to haunt me– these are all things that I had to deal with and figure out. Luckily, there wasn’t the same pressure of technique as there is with a gift, so I was able to learn and try out different problem-solving technique (cursing to myself the whole time). I wish I had double checked the uneven placement of the bright yellow print. But all those quirks give it that much personality. 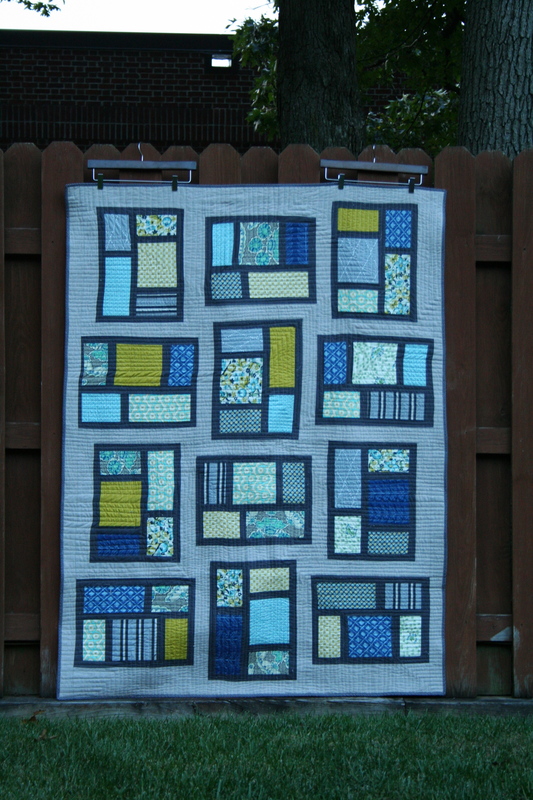 I am learning to love all of this quilt’s imperfections. 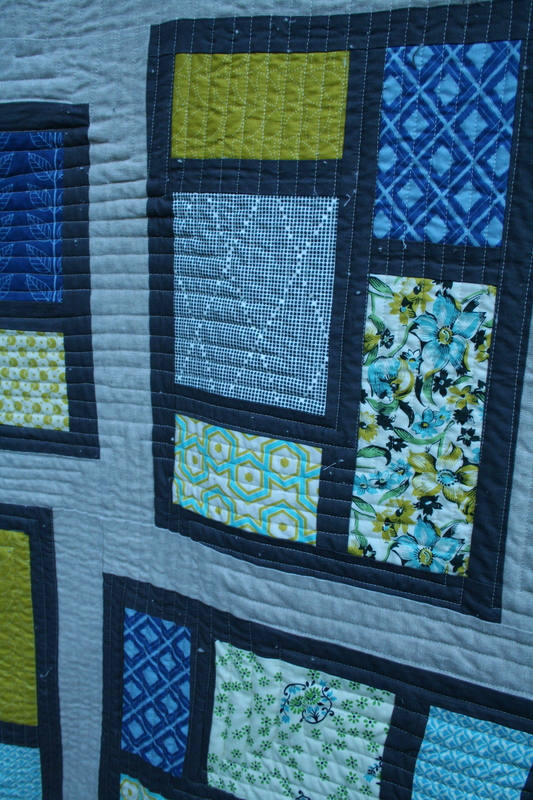 I didn’t have to learn how to love the quilting. It took forever, but I love it. I also love the Quilters Dream batting, but man, those fuzzballs stuck around for a while, even after a tumble in the dryer. I especially love how it came out on the back in my favorite print from the Shelbourne Falls collection. Thanks for checking it out! Have a great weekend. I love it!!!!!! And I love it that we all stitched a little bit of love into a quilt that will live in your house and wrap you guys up! Thanks Beth! I’m so grateful for the help in piecing this one! This is beautiful. That quilting is out of control gorgeous. I just want to pet it so I’m going to make my schedule get in line so I can visit. This is gorgeous and I love that back. You must visit it. We can watch Scandal and sew. In my dreams, of course, with our schedules. But I will dream it.